Home »Climbing»First Winter Climb…in April! The un-ending cold snap that embraced the UK had one unexpected benefit in that the mountains were still snow covered in April. 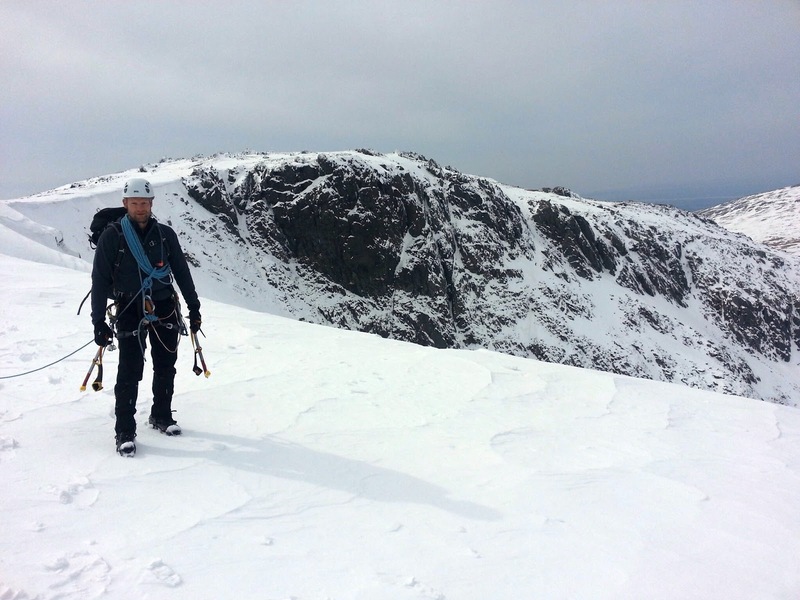 I was headed for the Tatras in Poland this Easter yet I looked on in envy at the fabulous winter conditions across the UK mountains being reported on Twitter. I was probably in a minority in willing the weather to remain cold for a further week and offer a final chance of a UK winter climb this year. I was checking the forums on UKClimbing.com for updates all week and as Friday arrived reports suggested winter conditions were holding. My climbing partner, Phillipa, picked up a N. Wales Winter Climbs guide book and we left London at 6pm for the journey north, punctuated by a quick curry-stop in Llangollen as knew we’d arrive in Capel Curig too late for dinner. It was 11.45pm as we checked in to a quiet Plas-y-Curig Hostel, tip-toeing around in our room trying not to disturb those already fast asleep in their bunk. In fact we never met our room-mates, they were still asleep when we left at 7.30am to grab a car-park space at Pen-y-pass. The previous night’s late arrival meant we hadn’t had chance to sort through the climbing gear I’d hastily thrown into the car before leaving, so after a quick cuppa in the cafe we began to sort our gear in the car-park. Unsure of what we needed, but guessing there wouldn’t be too much scope for protection on easier routes, we packed a 60m half-rope, slings, a rack of nuts and an ice-screw as well as the obligatory ice-ace (pair) and crampons which were conspicuously missing from most people setting off for a weekend able up Snowdon. 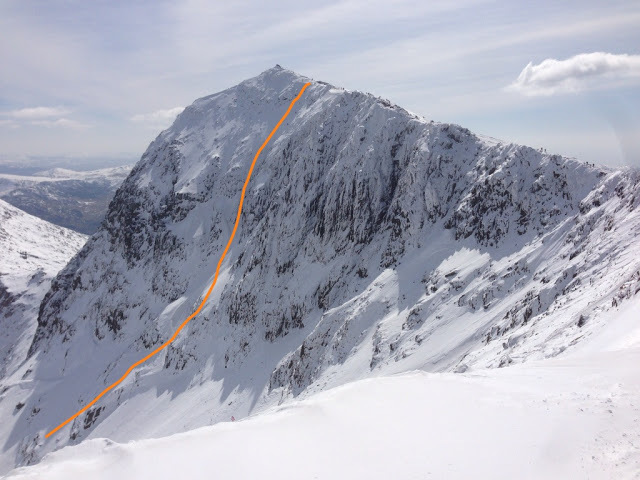 Our chosen route was Central Trinity – a 220m grade I/II winter climb that ascends an obvious line on the mighty north face of Snowdon, just above Llyn Glaslyn. We set off up the Pyg Track and within a few hundred metres we found we were already plodding through the snow. It was clear it was going to be a beautiful day with early sun glistening off the snow. 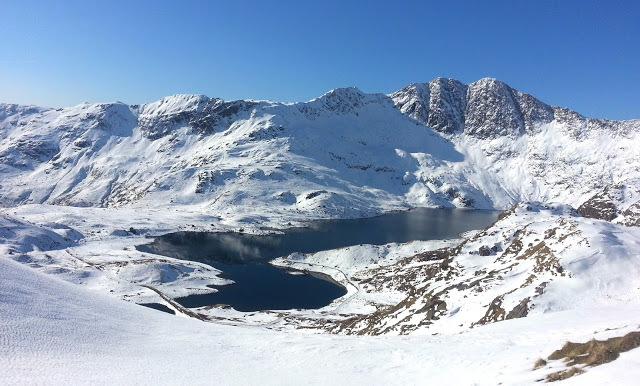 As we reached Bwylch y Moch, where we would normally detour up to Crib Goch, we were greeted with a stunning snowy vista and blue sky that wouldn’t look amiss in the Alps. Ignoring the lure of Crib Goch we continued along the Pyg Track, stopping before the junction with the Miners track to fit our crampons. Just past the junction with the Miners Track we diverted from the Pyg Track and headed left into the cwm. Stopping for a bite to eat at the base of the slope we donned our harnesses and helmets and racked some protection and slings. We could clearly see the central ‘spider’ ahead (not to be confused with the iconic ‘White Spider’ on the Eiger’s north face), the obvious snow-field were a number of climbing routes emanate. It was a straightforward calf-busting slog up to the spider, though it was already 11am and small lumps of ice periodically cascaded down from above. As we entered the shade of Snowdon the temperature dropped a little. This combined with the increased altitude mean the snow was firming a little. We stopped in the ‘spider’ to catch our breath and check our bearings. Central Trinity gully was pretty obvious, exiting top-left, with a father and son ahead of us having just stopped at the base of the climb to sort their rope and some protection. We waited a while but it was getting chilly and we were being bombarded by ice from climbers above, so we were relieved when the pair asked to us proceed ahead of them. As the gully narrowed and steepened we settled into our thud-thud, stamp-stamp rhythm, alternatively engaging both ice-axes and then stepping up on the crampons. 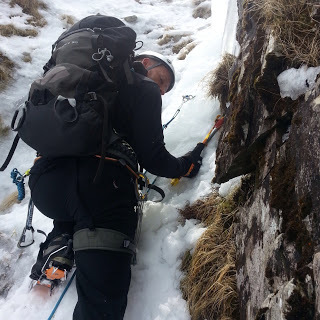 We were confident soloing without rope or protection and half way up the gully we encountered an ice-ramp. Pausing for breath and checking for any obvious protection we decided to press-on, the ice dictating a more thoughtful and deliberate placement of axes and feet. 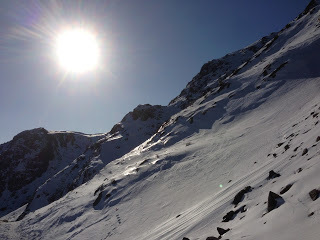 We were soon past and it was only when looking down we became apparent of the steepness (there’s a lesson there…!). Before we knew it we were out of the gully and the route opened out onto a wider slope. After another calf and lung-busting 70 metres we topped out on the ridge about 50m down from Snowdon’s summit and joined the throng who’d headed up the Llanberis and Pyg/Miners tracks. 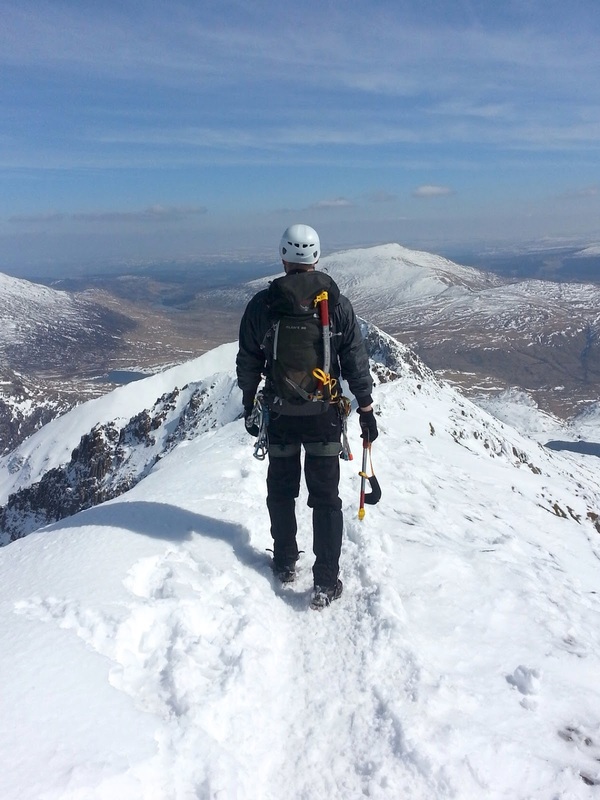 We’d earned our lunch and the panoramic view from the summit was to be savoured on such a wonderfully clear day. After replenishing our energy levels we decided that Crib Goch looked far too enticing to miss out on so we set off up Garnedd Ugain from where we could look across and see our earlier route up Trinity. If you look closely in the photo below you can just about see two climbers on our route (just down from the top of the route and just below the orange line). Crib Goch tends to be a little harder in the south to north direction as the main obstacles on the pinnacles have to be down-climbed. And so it proved, with the combination of mixed ground, axe in hand requiring careful footwork with the crampons. We met another party being shepherded with ropes around the third (our first) pinnacle but we decided to go up and over and faced a hairy down-climb on a snowy ledge, above a steep drop into Cwm Bach. Safely into the gap we headed straight up the second pinnacle, which I remembered has an awkward climb in ascent that didn’t appeal in descent while in crampons, but we managed to avoid it with nifty move to the right. Stopping for a quick drink and to savour the views we were approached by a party of around 20 students coming off the first pinnacle. Moving with trepidation, with neither axes or crampons, they were clearly making slow progress. It was about 2pm and they were only half-way along Crib Goch and were clearly heading for the summit of Snowdon terribly under-prepared. The stragglers of the group seemed distinctly unimpressed as their ‘leader’ gleefully pointed out the summit in the distance. It had all the hallmarks of another MRT statistic in the making! Pressing on up and over the first pinnacle the ridge narrowed considerably. The snow actually made it easier to walk on the ridge proper although I was acutely conscious of the need to not to catch a crampon on my trousers and trip, as I had done earlier! Finally we stood on Crib Goch summit – we’d traversed the ridge but we knew we still had to descend from 900m down the north-east face,which is distinctly easier in ascent. 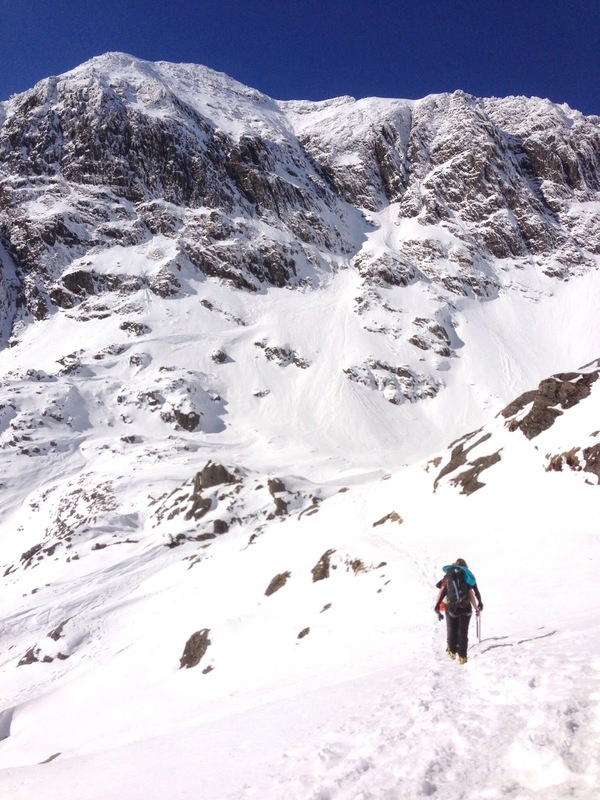 We finally arrived back at the car about 4.30pm, exhausted but exhilarated, our first winter climb completed and we couldn’t have asked for better conditions. The rope and our climbing gear had been un-touched but it’s better to be prepared than not! The forecast for the next day wasn’t quite so splendid but with heavy limbs we decided to get up and out and head to Ogwen valley. The forecast was for it to be a little warmer but it was overcast as we headed up to Llyn Idwal. We guessed we’d have to gain height to get decent snow conditions so veered up and away from the lake, trending towards East Wall Gully which leads up to Cwm Cneifon. On reaching the gully we decided gear up and practice rope-work and placing protection in winter conditions (and in gloves). Though there was no real need, we pitched/belayed some of the gully, then moved together placing running belays as we went until we reached a bowl that sat below Cwm Cneifon. Consulting the guide book* we tried and failed to reconcile our current position with the photos and diagrams. We concluded that we would need to move higher into Cwm Cneifon proper and rather than a snow plod around we decided on a more direct route up a narrow gully. The gully was rather steeper and icier than it first appeared but we managed to find a couple of spikes to place slings and on reaching some solid ice I placed my first ice-screw. As we entered the cwm proper we could see the dark crag of Clogwyn Du on the right of the headwall, but struggled to make out the climbing routes marked in the guide-book. It became clear that the diagram was drawn from a different perspective so we slogged up further into the cwm searching for Hidden Gully, a 60m grade II route behind the main crag. As we ascended and passed beneath the main face of the crag the other climbing routes became more obvious and then Hidden Gully finally revealed itself. The route was peppered with snowy steps from earlier ascents which made it more of a plod save for a few icy sections, protected by slings over spikes. We stepped out onto the Glyderau plateau but with a biting wind apparent we headed straight for the top of Y Gribin, a summer grade 1 scramble which would be a little more difficult in the snow. We stayed roped up to practice moving together, flicking the rope over rocks and spikes as we descended but the difficulties were short-lived and we were soon onto easier ground, making our way back down to Ogwen before a quick cuppa and the prospect of a long drive home. So a hastily arranged and opportunistic weekend turned out as great as we could have hoped – I’d never have believed we could have found such great conditions in April! 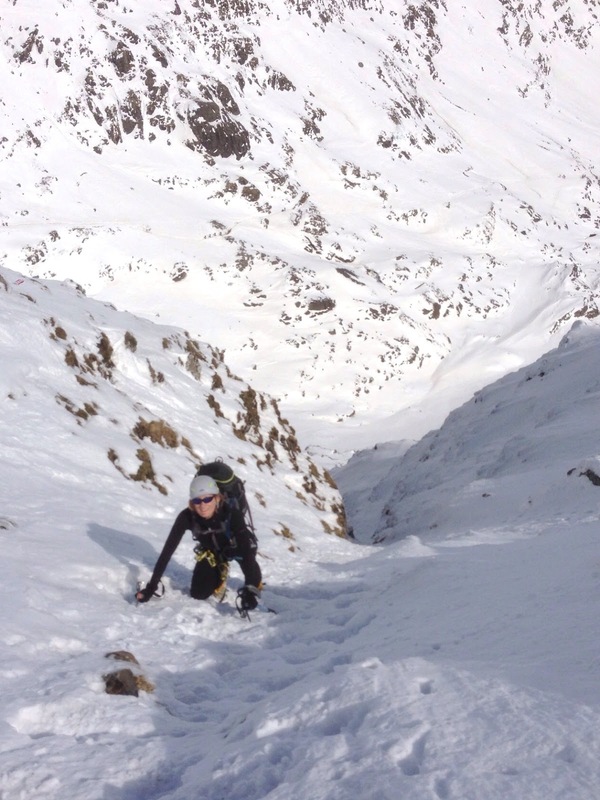 Our first winter climbs were ticked and more importantly experience banked and lessons learned. Rope-work and handling gear with gloves on, moving over mixed ground, reading the ground and conditions, handling axes, when to use the leash and when it gets in the way – stuff that only comes with practice and experience. We’ll be more confident in tackling some steeper stuff next winter. I was going to say ‘I can’t wait’ but I’m sure we’d all prefer a bit of summer first! 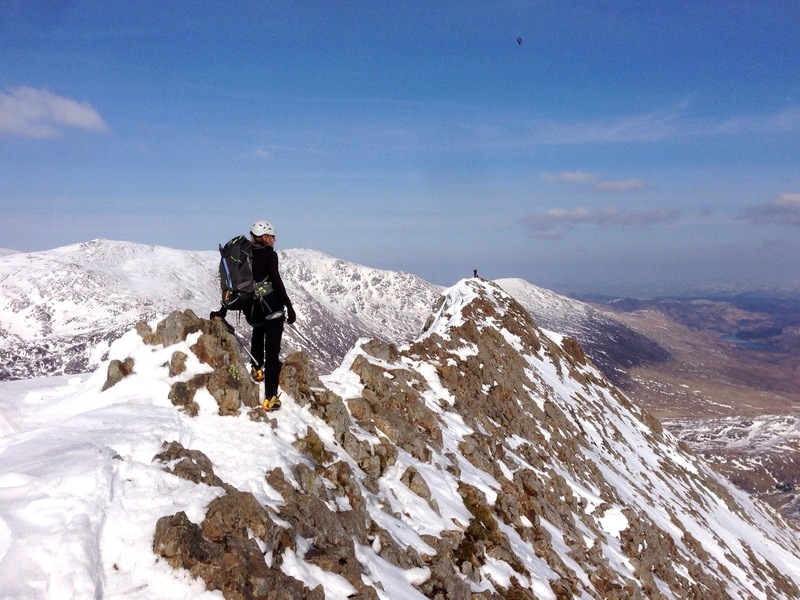 * the guide book we used was ‘North Wales Winter Climbing’ by Ground Up and is highly recommended.